Mauricio Salguero, clarinet, and Christopher Biggs, electro-acoustic composer, will be the guest performers at 6:30 p.m. Tuesday, Oct. 19, in the Recital Hall of the NIU Music Building. Salguero is a D.M.A. candidate at the University of Missouri-Kansas City (UMKC) Conservatory of Music under the guidance of Jane Carl. He was one of the winners of the Artist Presentation Society Auditions-2010 and will be performing as part of their 2010-11 concert series. His honors include a 2010 Inspiration Grant from the KCArts fund, the First Prize in the National Contest of Musical Composition from the Institute of Culture and Tourism City of Bogotá, Colombia, the Bettylou Scandling Hubin Scholarship in both World Music and Music Technology from Phi Mu Epsilon and the Spaulding/Warfield Memorial Scholarship from Sigma Alpha Iota. In 2008, he received the Preparing Future Faculty Fellowship from UMKC, a competitive program that focuses on college teaching, and he was recently featured in the recorded release of Stephen Yip’s “Gorintou” on the album Mosaic (Capstone Records, 2010). 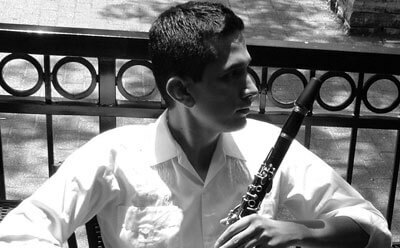 Salguero has appeared as a soloist with the Universidad Javeriana Orchestra, the University of Arkansas Wind Symphony and recently played Frank Martin’s Concerto for Seven Instruments with the Symphonic Orchestra of the UMKC Conservatory of Music. He also has performed at ClarinetFest 2008 and 2010. He holds a B.M. from the Universidad Javeriana in Bogotá, Colombia, and a M.M. from the University of Arkansas-Fayetteville. Biggs is a composer and multimedia artist residing in Kansas City, Mo. 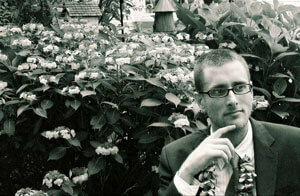 He is a co-founder and board member of the Kansas City Electronic Music and Arts Alliance (KcEMA). He also is a member of Quadrivium, a Kansas City-based ensemble dedicated to the performance of new music for flute, clarinet, cello, and piano. Along with Salguero, he forms part of a clarinet and electronic music duo called electro<>acústico. His music has been presented across the United States and Europe, as well as in Latin America and Asia. His music is regularly performed on conferences, festivals and recitals. He received the 2008 Missouri Music Teacher’s Association composer of the year and the 2009 SEMAUS/ASCAP first place award. His first music release, Metatexts, is available through major online music retailers. Biggs is a passionate and dedicated teacher. He has taught extensively at the college level. He is currently a full-time instructor at Iowa Western Community College where he coordinates and teaches the technical music program. He was a Preparing Future Faculty Fellow at the University of Missouri-Kansas City from 2007-10 and has taught music composition, electronic music courses, audio technology, orchestration, music theory and computer programming for musicians. He received degrees from the University of Missouri-Kansas City (D.M.A. ), the University of Arizona (M.M) and American University (B.A. ).